Louise Ann (Young) Penney, 92 of Rockland. 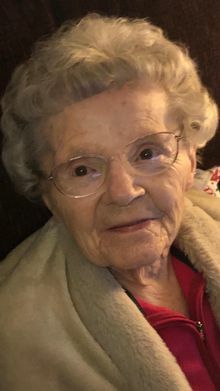 Died on January 12, 2019 at South Shore Hospital in Weymouth. She was born on January 14, 1926 in Boston to the late Thomas and Ethel (DeBird) Young. She was raised and educated in Dorchester and attended the Dorchester School for Girls. She was the loving wife of the late Eugene Penney. After high school, Nana Penney attended the Cadet Nursing School at Boston City Hospital. She then worked for Braeburn Nursing in Whitman and after 20 years she retired and worked as an aide for children with special needs at the Esten School in Rockland. Nana Penney enjoyed spending her time traveling, bowling and doing a little gambling. She was an avid reader who loved nothing more than spending time with her family. Especially her grandchildren, great grandchildren and great great grandchildren. Nana Penney's life mission was to help others and she did that until her final days. She was the loving mother of Patricia E. Dolan of Naples FL and her late husband Richard Dolan, Helen L. Krueger of Norwell and her husband Robert Kruegar, Jean C. Thornton of Whitman and her husband James Thornton, Janice M. Maw of Bridgewater and her husband David Maw and Richard E. Penney of Rockland and his wife Patricia Penney. Nana Penney was the sister of the late Ethel Mullen and Thomas Young. She is survived by her twelve grandchildren, twenty seven great grandchildren and two great great grandchildren. She is predeceased by her granddaughter Jennifer Thornton and grandson David Dunn. The family welcomes friends and loved ones to celebrate Nana Penney's life on Thursday January 17, 2019 from 5:00 PM to 8:00 PM at the Magoun-Biggins Funeral Home, 135 Union Street Rockland, MA. A funeral home service will be held on Friday January 18, 2019 at 10:00 AM. Burial will be held at a later date at Mt. Pleasant Cemetery in Rockland. Donations can be made in the name of her late husband Eugene Penney and her late granddaughter Jennifer Thornton to the Dana Farber Cancer Institute. I'm so sorry to hear of your Mom's passing. I regret not getting this information a bit sooner, as I would have been there to see you. Rich and Patty so sorry for loss. Rich your a testament to what a great woman she was, our thoughts are with you and your family. A message from my son Patrick via my brother John on Thursday afternoon was met with profound sadness. The playfullness and welcoming in your Mom's voice along with her wide-eyed joy in living will remain with me forever. Helen, Rob, and family please accept my condolences on your loss. Donna - I know how much you loved her and so committed to your Monday visits - the conversations you had together that you shared with me - you both blessed to have had each other. I did not know she was called Many Penny - so sweet and her photo - she looks like a real gem. Love you. We are so sorry for your loss. Your family is in our thoughts and prayers. May she rest in peace. Louise is now your guardian angel. Sending you all our prayers & comforting hugs. May Nana Penney rest in the sweetest of peace. Patti, Rich and Penney Family, I am so sorry for the loss of Nana Penney. My thoughts and prayers are with you.